A look at the various shot types available in Mario Tennis Aces. If you recently picked up a copy of Mario Tennis Aces, you may find yourself wondering what the best shot types are in the game. There are a variety of shot types in Mario Tennis Aces, each with their own unique pro and con. In order to truly dominate the court, you’ll need to learn each of the different shot types in Mario Tennis Aces, and what these shot types are good for. To help you out, we put together a guide guide to all shot types in Mario Tennis Aces! Below, you'll find a complete list of all shot types in Mario Tennis Aces. Flat Shot (Y): The Flat Shot is (as its name suggests) a flatter shot in Mario Tennis Aces capable of landing near the back of your opponent’s side of the court. Slice Shot (B): In Mario Tennis Aces, the Slice Shot is slower and capable of bouncing closer to the net on the other end of the court. 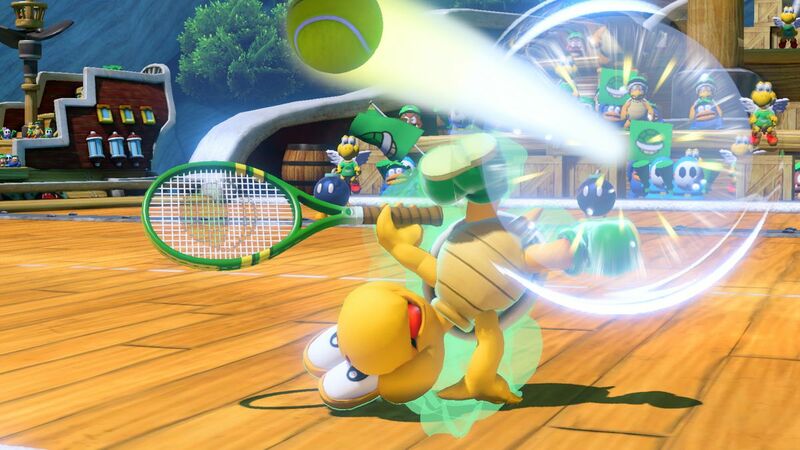 Topspin Shot (A): The standard shot type in Mario Tennis Aces is the Topspin Shot, which is one of the quicker shots available to you in the game. Lob Shot (Left Stick Up + X): In Mario Tennis Aces, the Lob Shot arcs high in the air and lands near the back of your opponent’s court. Trick Shot (Right Stick): To have a little fun, try the Trick Shot in Mario Tennis Aces by moving the Right Stick quickly to either side. This causes your character to move across the court and reach a ball that previously seemed beyond reach. Drop Shot (Left Stick Down + X): The Drop Shot is similar to the Slice Shot in Mario Tennis Aces in that it’s slower and lands near the net, forcing your opponent to dive for the ball. Zone Shot (R): In order to use the Zone Shot in Mario Tennis Aces, you’ll need to have enough energy stored. Once you have the right amount of stored energy, you can use the Zone Shot to aim the ball before smacking it into your opponent’s court. Special Shot (L): Again, you’ll need to have enough energy stored up to use the Special Shot in Mario Tennis Aces. With your energy full, tap the L button to use your Special Shot, which is essentially a charged (and more powerful) version of the Zone Shot. And there you have it, a look at all of the different shot types found in Mario Tennis Aces. To make the most of each shot, you’ll want to keep your opponent’s position on the court in mind. If your opponent is located near the net, try using your Lob Shot to send them racing to the back of the court. Additionally, note your Zone Shot and Special Shot which can run your opponent ragged as long as you have enough energy stored to use them properly. Everyone has their own strategy, so try out each shot and see which ones work the best with your unique play style. Which shot types do you use the most right now, and how do you strategize your shots? Let us know in the comments below, and be sure to check out our guide on how to beat the Reflection Room in Mario Tennis Aces! By reading through this guide, you should now have a firm understanding of each of the different shot types in Mario Tennis Aces.